John Haynes Holmes was a prominent Unitarian minister and pacifist, noted for his anti-war activism. Holmes was born in Philadelphia, studied at Harvard, graduating in 1902, and Harvard Divinity School, which he graduated in 1904. He was then called to his first church in Dorchester, Massachusetts. In 1907 he was called to the Church of the Messiah (Unitarian) in New York City. He wrote many books, many hymns, and a play, If This Be Treason, that had a brief run on Broadway. He was a popular lecturer and debater, including a debate over Prohibition with Clarence Darrow (Darrow was against it). He helped found the National Association for the Advancement of Colored People (NAACP) in 1909 and also the American Civil Liberties Union (ACLU) in 1920, which he later chaired. He worked closely with Rabbi Stephen Wise of New York; the book Rabbi and Minister details this friendship and their working relationship on social and religious and political causes. 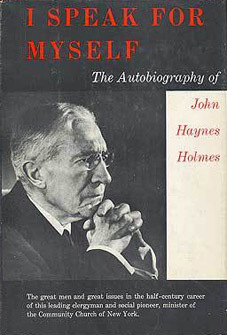 Holmes was one of the people who publicized the work of Gandhi from his pulpit in the United States; Holmes describes his meetings and interactions with Gandhi in his book My Gandhi. He was a recipient of the Gandhi Peace Award.